Grey Matter Press, 9781940658988, 322pp. Matt McLeod is a man plagued since childhood by a malevolent darkness that threatens to consume him. Following a lifetime spent wrestling for control over this lethal onslaught, he's learned to wield his mysterious paranormal skill to achieve an odious goal: retribution as a supernatural vigilante. 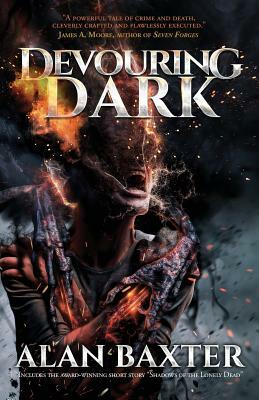 Devouring Dark is a genre-smashing supernatural thriller that masterfully blends elements of crime and horror in an adrenaline-fueled, life-or-death rollercoaster ride that's emblematic of the fiction from award-winning author Alan Baxter.